A versatile evergreen tree, Magnolia ‘Teddy Bear’ is a smaller growing feature tree or hedging plant. The main feature is the attractive foliage which makes it a standout from other cultivars. The original species is a large tree that can reach 30m in height, while Teddy Bear will reach around 5 – 7 m depending on conditions. Used widely as a hedging plant this is a tree that with its glossy foliage backed with the bronze downy underside also has attractive fragrant flowers. 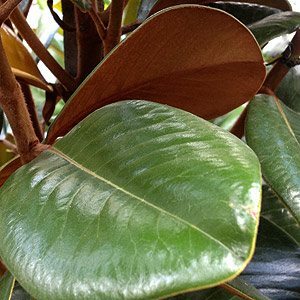 Where Magnolia Teddy Bear shines is that the foliage is held tightly and the leaves are an attractive rounded shape. This is also a tree that can easily be pruned, in fact it takes well to both tip pruning on a regular basis as well as responding to hard pruning. If pruned selectively from an early age the size can be maintained at much less than 7m with relative ease. Like all evergreen magnolias Teddy Bear is shallow rooted, it is best not to dig around the tree, in fact a good layer of mulch is beneficial in keeping the root run cool and clear of weeds. Fairly tolerant of conditions, growing well in warmer areas, but also coping in cold climates. In cooler areas the growth rate will be slower. Used as both a specimen plant and as hedging plant or screen the lovely dense foliage is a glossy green backed with the typical felted rusty brown of the species. The Teddy Bear Magnolia grows well in a humus rich deep moist soil. A position with some protection from the heat of the afternoon sun is best in warmer climates. Height – Will reach around 4 metres in height over 10 years, taller over time. Easily pruned to size. Spread – Will spread to around 2 – 3 metres. Growth habit – Fastigiate, a natural upright habit. Growth rate – Regarded a moderate. Actual growth rate will depend on soil and climate. Faster growth in warmer climates and good soil. Flowers – Large white cup shaped and lightly perfumed. Very few real problems with this desirable cultivar. It does require water during very dry spells, although once established and mulched it copes very well. Leaf litter is easily controlled, and although scale can be a problem it is easily controlled. In extremes of hot weather, if grown in full afternoon sun the plant may be subject to a little leaf burn, however it recovers well.